In order to win more, you should add spin and speed to your serve. 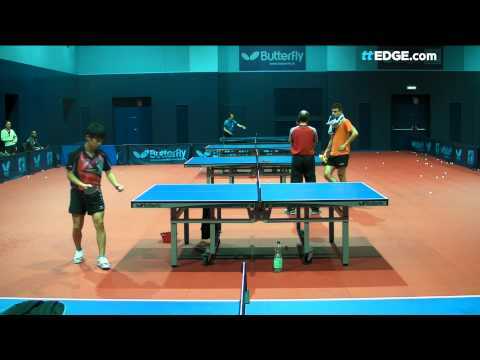 So what is the speed of the fastest serve in table tennis? In India open 2017, Sakai won Junior first place in this event (U21). You can see the beginning of this footage, Sakai has fastest serve captured by TT edge channel, the calculated speed to be about 54 Km/hr. So until now, the fastest serve in table tennis is made by Asuka Sakai. The highest speed recorded is: 54 km/h, equivalent to 15 m/s or 33.5 mph. That is very impressive, considering the initial state of the ball is like stationary. What is the highest speed that a table tennis can make to the ball? Well, it is the forehand smash. The smash is the most powerful shot in table tennis. Dimitry Ovtcharov can smash an oncoming ball over 122 km/h. It is easy to add speed in the smash because you take the initiative ball speed. For the serve, it’s much harder to add speed. So the highest ball speed ever recorded in table tennis is 122 km/h. Here is the list of the measured forehand smash speed of another top professional player. Lösung: Wie schnell ist 'Dima' und wer trifft Timo? Thank you coach. So is speed or spin more important in table tennis ?